The Madison Range is a mountain range located in the Rocky Mountains of Montana and Idaho in the United States. The range was named in honor of future President of the United States, then U.S. Secretary of State James Madison by Meriwether Lewis as the Lewis and Clark Expedition travelled through Montana in 1805. The range extends 80 miles (130 km) from West Yellowstone, Montana to Bozeman, Montana and is flanked by the Madison River on the west and the Gallatin River to the east. The highest point in the range is Hilgard Peak at 11,316 ft (3,449 m), a remote peak that wasn't climbed until 1948. The Madison Range is the westernmost section of what is collectively referred to as the Greater Yellowstone Ecosystem. Most of the range lies within Beaverhead-Deerlodge and Gallatin National Forests. A small portion of the range has been further protected with the creation of the Lee Metcalf Wilderness. The region has grizzly and black bears and at least one pack of wolves. Most other larger mammal species native to the region continue to exist in the range. Quake Lake lies not far to the south of Hilgard Peak. The lake was created by a landslide which dammed the Madison River at the time of the M7.5 1959 Hebgen Lake earthquake. ^ "Hilgard Peak". Summitpost. Retrieved 2008-09-10. 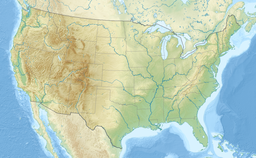 ^ U.S. Geological Survey. "Largest Earthquake in Montana". Historic Earthquakes. Archived from the original on 2007-06-08. Retrieved 2008-09-10.